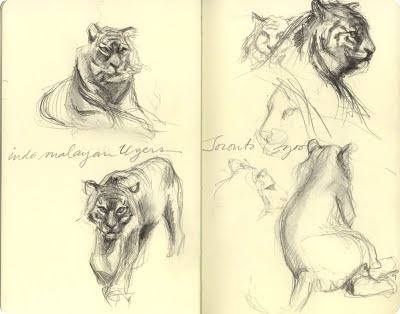 Last week I went sketching at the Toronto Zoo. Last year when I agreed to participate in an episode of Star Portraits (currently airing on Bravo! 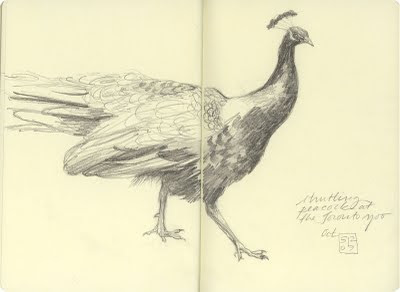 in Canada--click here for details), I was forced to confront something that I knew, but hadn't really acknowledged: I am utterly uncomfortable drawing or painting in front of an audience. 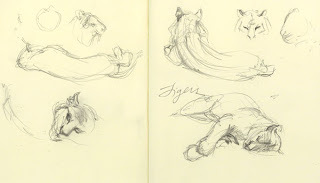 I love to draw from life and I participate in weekly life drawing sessions, but in that setting most artists are too intent on their own work to take much notice of their peers. I realize that it's very seldom that any eyes but my own see my work in progress. I've moved from the very public work environment of art school, to the semi-privacy of a shared studio, to the complete solitude of my own studio space. I've become used to working unobserved. I'm certainly more productive and less distracted in my own studio, but the luxury of my own space has made me a little more insular in my work habits than I ever intended. I'll never abandon my studio practice--I love my time alone at the easel--but I miss that feeling of tense engagement I get when I work in public. In the studio, I can let my attention wander. Out in the world, I need to concentrate differently. So I've resolved to draw, and eventually paint, more often in public spaces. The zoo was a perfect place to begin. 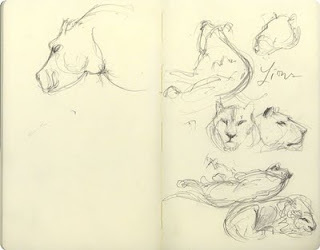 The animals don't object to being closely observed; their forms and attitudes are unfamiliar enough that I can't make any assumptions while I draw; and I get an innoculation against my spectator anxiety with every new surge of school children swarming around me to see the zoo exhibits. Plus, the flâneur in me loves to be solo in a crowd--lingering wherever I want, observing everything, and being at no one's whim but my own. 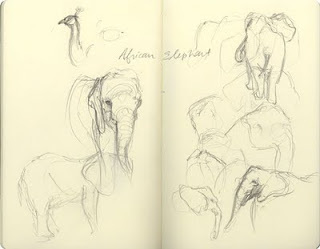 I'm planning another zoo visit in November.